Good food doesn’t have to be oily and salty, and there’s also days you don’t feel like having heavy meal. 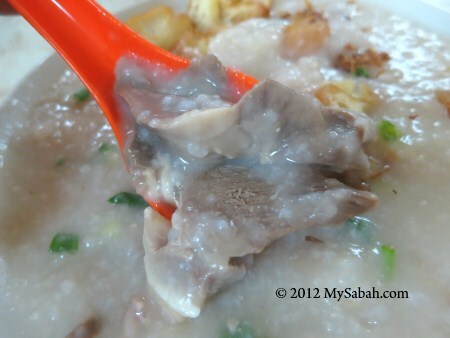 Whether I’m hungry or lack of appetize, porridge always works for me, especially the Hong Kong Porridge of Pak Ka Lok (百家樂). I have no problem eating there every day, really..
Pak Ka Lok Food Park (百家樂飲食中心) is located at a quiet corner of a shopping mall. I don’t know why they pick that location, as if they want to hide their shop. 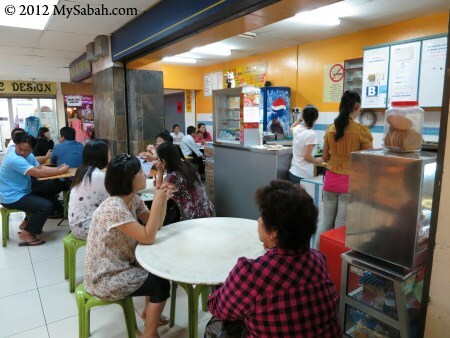 The shop has less than 10 tables, so the seats are always full during lunch time. Anyway, I don’t mind to wait for my turn like the others. I notice more than half of their customers are lady. Most locals take porridge as breakfast, but not lunch. Some guys say they would be hungry again after they pee a few times, haha. Well, you can always order extra meat. 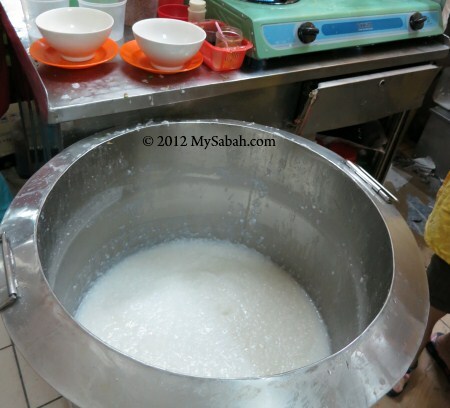 The porridge of Pak Ka Lok is served in Guangdong or Cantonese style, they boil the rice with excessive water until it turns mashed. 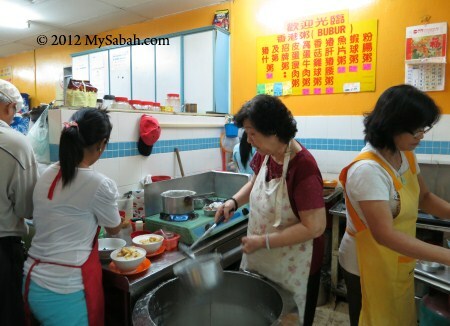 In other styles (less common in Sabah), they simply soak the rice in soup. Pic: the food menu of Pak Ka Lok. You can click it to see the food items and their prices. 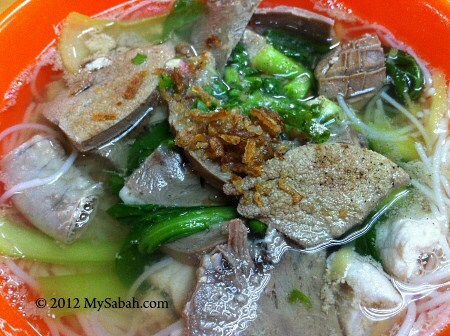 Mixed pork porridge is their specialty, but you also can order Mixed Pork Soup Noodle. FYI, Kon Lo means dry noodle. When my porridge comes, I’m delighted by the aroma of rice and meat. Slices of fried Chinese bread stick (yau ja gwai), salty vege, scallion and shreded ginger in the porridge. Pic: let me scoop out the meat to show you. 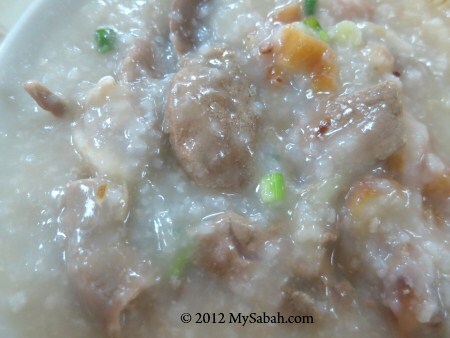 Each bowl of Mixed Pork Porridge costs RM5.50 (≈USD1.83). I asked for extra meat (ka-liao, or 加料 in Chinese), so it is RM7.50 (≈USD2.50)*. Mixed Pork means a mix of meat and internal organs such as liver, kidney, intestine and heart. Some westerners wonder why Chinese eats internal organs, usually the unwanted parts in western cuisines. People need to understand that famine is very common in Chinese history, due to natural disasters and civil wars. To survive the hunger, Chinese wastes no part of their livestock and this has become a food culture. 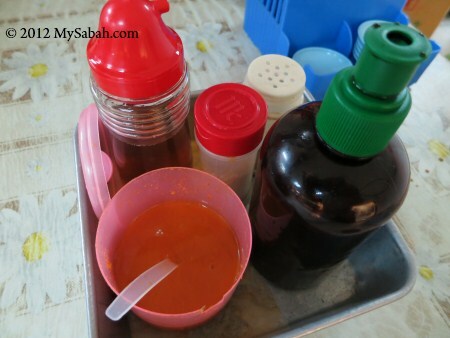 Pepper, soy sauce, chili sauce and sesame oil are available if you want additional flavor. 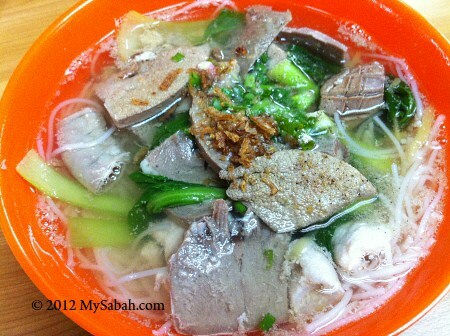 They also serve mixed pork in soup noodle, a must-try too. 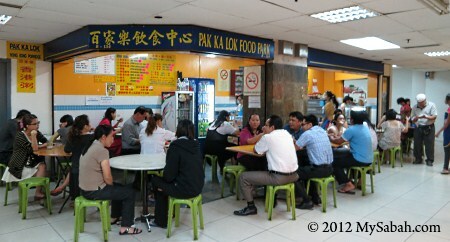 Pak Ka Lok Food Park (百家樂飲食中心) is in Wisma Merdeka, a shopping mall in city center of Kota Kinabalu. The shop address is: No. 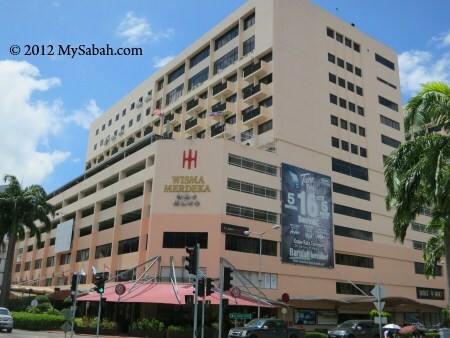 B-134, 1st Floor, Phase 2, Wisma Merdeka. 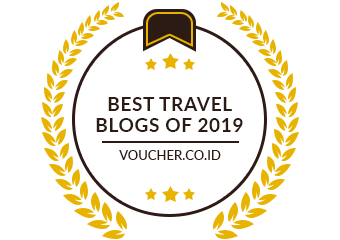 They open from 8.30am to 3pm every day, and rest two days a month. To confirm if the shop is open, you may call them at +60 88-231121 before you go. As I mentioned, this shop is at a “hidden” corner and many don’t know where it is. The easiest way is to ask people where is Tong’s Departmental Store (1st floor). When you reach the storefront of Tong’s, turn left and walk until the end and you will see Pak Ka Lok.